Bednarz, James P. (2004). "Marlowe and the English literary scene". In Cheney, Patrick Gerard (ed.). The Cambridge Companion to Christopher Marlowe. Cambridge: Cambridge University Press. pp. 90–105. doi:10.1017/CCOL0521820340. ISBN 978-0-511-99905-5 – via Cambridge Core. Bloom, Harold (2008). Heims, Neil (ed.). King Lear. Bloom's Shakespeare Through the Ages. Bloom's Literary Criticism. ISBN 978-0-7910-9574-4. Bradbrook, M.C. (2004). "Shakespeare's Recollection of Marlowe". In Edwards, Philip; Ewbank, Inga-Stina; Hunter, G.K. (eds.). Shakespeare's Styles: Essays in Honour of Kenneth Muir. Cambridge: Cambridge University Press. pp. 191–204. ISBN 978-0-521-61694-2. Brooke, Nicholas (2004). "Language and Speaker in Macbeth". In Edwards, Philip; Ewbank, Inga-Stina; Hunter, G.K. (eds.). Shakespeare's Styles: Essays in Honour of Kenneth Muir. Cambridge: Cambridge University Press. pp. 67–78. ISBN 978-0-521-61694-2. Drakakis, John (1985). "Introduction". In Drakakis, John (ed.). Alternative Shakespeares. New York: Methuen. pp. 1–25. ISBN 978-0-416-36860-4. Dryden, John (1889). Arnold, Thomas (ed.). Dryden: An Essay of Dramatic Poesy. Oxford: Clarendon Press. hdl:2027/umn.31951t00074232s. ISBN 978-81-7156-323-4. OCLC 7847292. OL 23752217M. Foakes, R.A. (1990). "Playhouses and players". In Braunmuller, A.R. ; Hattaway, Michael (eds.). The Cambridge Companion to English Renaissance Drama. Cambridge: Cambridge University Press. pp. 1–52. ISBN 978-0-521-38662-3. Friedman, Michael D. (2006). "'I'm not a feminist director but…': Recent Feminist Productions of The Taming of the Shrew". In Nelsen, Paul; Schlueter, June (eds.). Acts of Criticism: Performance Matters in Shakespeare and his Contemporaries. New Jersey: Fairleigh Dickinson University Press. pp. 159–174. ISBN 978-0-8386-4059-3. Grady, Hugh (2001a). "Modernity, Modernism and Postmodernism in the Twentieth Century's Shakespeare". In Bristol, Michael; McLuskie, Kathleen (eds.). Shakespeare and Modern Theatre: The Performance of Modernity. New York: Routledge. pp. 20–35. ISBN 978-0-415-21984-6. Jackson, MacDonald P. (2004). Zimmerman, Susan (ed.). "A Lover's Complaint revisited". Shakespeare Studies. XXXII. ISSN 0582-9399 – via The Free Library. Johnson, Samuel (2002) [first published 1755]. Lynch, Jack (ed.). Samuel Johnson's Dictionary: Selections from the 1755 Work that Defined the English Language. Delray Beach, FL: Levenger Press. ISBN 978-1-84354-296-4. Jonson, Ben (1996) [first published 1623]. "To the memory of my beloued, The AVTHOR MR. WILLIAM SHAKESPEARE: AND what he hath left vs". In Hinman, Charlton (ed.). The First Folio of Shakespeare (2nd ed.). New York: W.W. Norton & Company. ISBN 978-0-393-03985-6. Levin, Harry (1986). "Critical Approaches to Shakespeare from 1660 to 1904". In Wells, Stanley (ed.). The Cambridge Companion to Shakespeare Studies. Cambridge: Cambridge University Press. ISBN 978-0-521-31841-9. Ringler, William, Jr. (1997). "Shakespeare and His Actors: Some Remarks on King Lear". In Ogden, James; Scouten, Arthur Hawley (eds.). In Lear from Study to Stage: Essays in Criticism. New Jersey: Fairleigh Dickinson University Press. pp. 123–134. ISBN 978-0-8386-3690-9. Rowe, Nicholas (1997) [first published 1709]. Gray, Terry A. (ed.). Some Acount of the Life &c. of Mr. William Shakespear. Retrieved 30 July 2007. Gross, John (2003). "Shakespeare's Influence". In Wells, Stanley; Orlin, Lena Cowen (eds.). Shakespeare: An Oxford Guide. Oxford: Oxford University Press. ISBN 978-0-19-924522-2. Kathman, David (2003). "The Question of Authorship". In Wells, Stanley; Orlin, Lena Cowen (eds.). Shakespeare: an Oxford Guide. Oxford Guides. Oxford: Oxford University Press. pp. 620–632. ISBN 978-0-19-924522-2. Thomson, Peter (2003). "Conventions of Playwriting". In Wells, Stanley; Orlin, Lena Cowen (eds.). Shakespeare: An Oxford Guide. Oxford: Oxford University Press. ISBN 978-0-19-924522-2. Wright, George T. (2004). "The Play of Phrase and Line". In McDonald, Russ (ed.). Shakespeare: An Anthology of Criticism and Theory, 1945–2000. Oxford: Blackwell. ISBN 978-0-631-23488-3. The late romances, often simply called the romances, are a grouping of William Shakespeare's last plays, comprising Pericles, Prince of Tyre; Cymbeline; The Winter's Tale; and The Tempest. The Two Noble Kinsmen, of which Shakespeare was co-author, is sometimes also included in the grouping. The term "romances" was first used for these late works in Edward Dowden's Shakespeare: A Critical Study of His Mind and Art (1875). Later writers have generally been content to adopt Dowden's term. Benjamin Jonson was an English playwright, poet, actor, and literary critic, whose artistry exerted a lasting impact upon English poetry and stage comedy. He popularised the comedy of humours. He is best known for the satirical plays Every Man in His Humour (1598), Volpone, or The Fox, The Alchemist (1610) and Bartholomew Fair (1614) and for his lyric and epigrammatic poetry. "He is generally regarded as the second most important English dramatist, after William Shakespeare, during the reign of James I." Shakespeare's sonnets are poems that William Shakespeare wrote on a variety of themes. 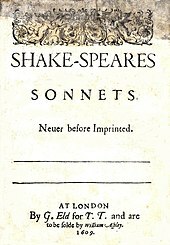 When discussing or referring to Shakespeare’s sonnets, it is almost always a reference to the 154 sonnets that were first published all together in a quarto in 1609; however there are six additional sonnets that Shakespeare wrote and included in the plays Romeo and Juliet, Henry V and Love's Labour's Lost. John Shakespeare was an English businessman in Stratford-upon-Avon and the father of William Shakespeare. He was a glover and whittawer by trade. 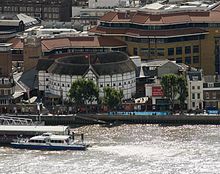 Shakespeare was elected to several municipal offices, serving as an alderman and culminating in a term as bailiff, the chief magistrate of the town council, and mayor of Stratford in 1568, before he fell on hard times for reasons unknown. His fortunes later revived and he was granted a coat of arms five years before his death, probably at the instigation and expense of his playwright son. 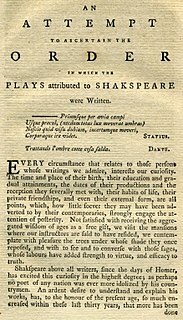 This article presents a possible chronological listing of the composition of the plays of William Shakespeare. 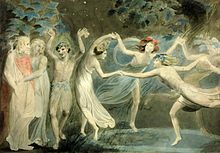 William Henry Ireland (1775–1835) was an English forger of would-be Shakespearean documents and plays. He is less well known as a poet, writer of gothic novels and histories. Although he was apparently christened William-Henry, he was known as Samuel through much of his life, and many sources list his name as Samuel William Henry Ireland. 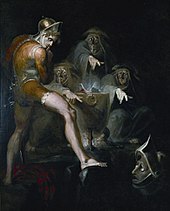 The Shakespeare apocrypha is a group of plays and poems that have sometimes been attributed to William Shakespeare, but whose attribution is questionable for various reasons. 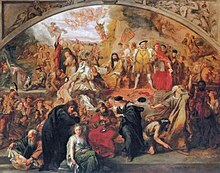 The issue is separate from the debate on Shakespearean authorship, which addresses the authorship of the works traditionally attributed to Shakespeare. Mr. William Shakespeare's Comedies, Histories, & Tragedies is the 1623 published collection of William Shakespeare's plays. Modern scholars commonly refer to it as the First Folio. It is considered one of the most influential books ever published in the English language. William Shakespeare was an actor, playwright, poet, and theatre entrepreneur in London during the late Elizabethan and early Jacobean eras. 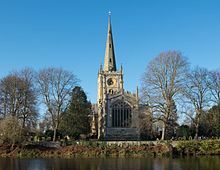 He was baptised on 26 April 1564 in Stratford-upon-Avon in Warwickshire, England, in the Holy Trinity Church. At age of 18 he married Anne Hathaway with whom he had three children. He died in his home town of Stratford on 23 April 1616 at the age of 52. Though more is known about Shakespeare's life than those of most other Elizabethan and Jacobean writers, few personal biographical facts survive, which is unsurprising in the light of his social status as a commoner, the low esteem in which his profession was held, and the general lack of interest of the time in the personal lives of writers. Information about his life derives from public instead of private documents: vital records, real estate and tax records, lawsuits, records of payments, and references to Shakespeare and his works in printed and hand-written texts. 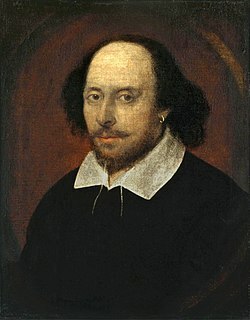 Nevertheless, hundreds of biographies have been written and more continue to be, most of which rely on inferences and the historical context of the 70 or so hard facts recorded about Shakespeare the man, a technique that sometimes leads to embellishment or unwarranted interpretation of the documented record. The sexuality of William Shakespeare has been the subject of recurring debate. It is known from public records that he married Anne Hathaway and that they had three children; scholars have analysed their relationship through these documents, and particularly through the bequests to her in Shakespeare's will. Some have speculated Shakespeare had affairs with other women, based on contemporaries' written anecdotes of such affairs and sometimes on the "Dark Lady" figure in his sonnets. 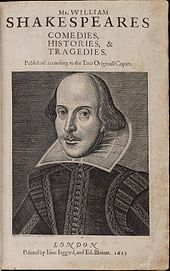 Some scholars have argued he was bisexual, based on analysis of the sonnets: many, including Sonnet 18 "Shall I compare thee to a summer's day", are love poems addressed to a man, the "Fair Youth", and contain puns relating to homosexuality. 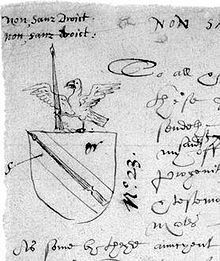 Susanna Hall was the oldest child of William Shakespeare and Anne Hathaway, and the older sister of Judith Quiney and Hamnet Shakespeare. She married John Hall, a local physician, in 1607. They had one daughter, named Elizabeth, in 1608. Elizabeth married Thomas Nash, son of Anthony Nash on 22 April 1626 at Holy Trinity Church, Stratford-upon-Avon. 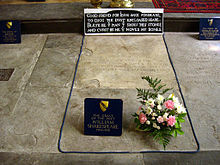 The Shakespeare funerary monument is a memorial to William Shakespeare located inside Holy Trinity Church at Stratford-upon-Avon, the church in which Shakespeare was baptised and where he was buried in the chancel two days after his death. 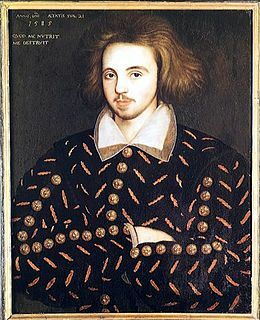 The Marlovian theory of Shakespeare authorship holds that the Elizabethan poet and playwright Christopher Marlowe was the main author of the poems and plays attributed to William Shakespeare. Rather, the theory says Marlowe did not die in Deptford on 30 May 1593, as the historical records state, but that his death was faked. 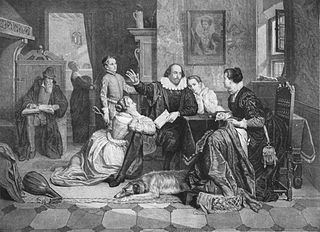 Hamnet Shakespeare was the only son of William Shakespeare and Anne Hathaway, and the fraternal twin of Judith Shakespeare. He died at the age of 11. Some Shakespearean scholars speculate on the relationship between Hamnet and his father's later play Hamlet, as well as on possible connections between Hamnet's death and the writing of King John, Romeo and Juliet, Julius Caesar, and Twelfth Night. The religious views of William Shakespeare are the subject of an ongoing scholarly debate dating back more than 150 years. The general assumption about William Shakespeare's religious affiliation is that he was a conforming member of the established Anglican Church. However, many scholars have speculated about his personal religious beliefs, based on analysis of the historical record and of his published work, with claims that Shakespeare's family may have had Catholic sympathies and that he himself was a secret Catholic. William Shakespeare's style of writing was borrowed from the conventions of the day and adapted to his needs. 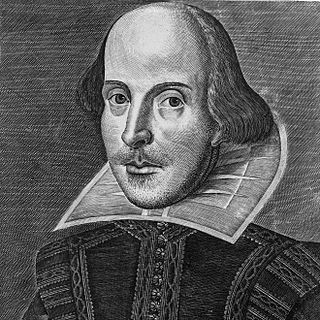 Shakespeare attribution studies is the scholarly attempt to determine the authorial boundaries of the William Shakespeare canon, the extent of his possible collaborative works, and the identity of his collaborators. The studies, which began in the late 17th century, are based on the axiom that every writer has a unique, measurable style that can be discriminated from that of other writers using techniques of textual criticism originally developed for biblical and classical studies. The studies include the assessment of different types of evidence, generally classified as internal, external, and stylistic, of which all are further categorised as traditional and non-traditional. The Shakespeare authorship question is the argument that someone other than William Shakespeare of Stratford-upon-Avon wrote the works attributed to him. Anti-Stratfordians—a collective term for adherents of the various alternative-authorship theories—believe that Shakespeare of Stratford was a front to shield the identity of the real author or authors, who for some reason did not want or could not accept public credit. Although the idea has attracted much public interest, all but a few Shakespeare scholars and literary historians consider it a fringe belief, and for the most part acknowledge it only to rebut or disparage the claims. 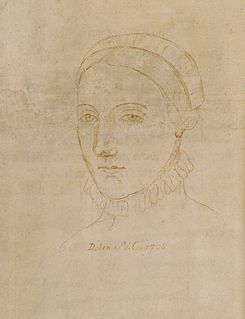 The only surviving image that may depict Anne Hathaway, the wife of William Shakespeare, is a portrait line-drawing made by Sir Nathaniel Curzon in 1708, referred to as "Shakespear's Consort". It was probably traced from a lost Elizabethan original. The drawing is currently located in the Colgate University Libraries, Special Collections and University Archives, Hamilton, NY.